A growing technology market demands new skills and knowledge. Solve today’s business challenges and prepare for tomorrow with unlimited access to in-depth online training and resources. 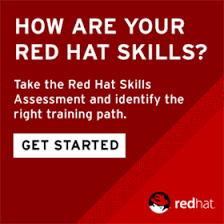 Red Hat Learning Subscription delivers access to Red Hat online training resources in a single, annual subscription. Watch videos, take courses, and complete hands-on labs online, at your own pace. Customize your learning experience to access online training classes, certification exams, or video courses by choosing your subscription tier. What's the difference between Basic and Standard Subscriptions? Red Hat is a leading provider of open-source software and IT solutions for the enterprise community. Understanding Red Hat solutions and enhancing your skills with the software will allow you to maximize its value and efficiency for your organization. New Horizons Learning Group offers a number of courses and training options that you need in order to prepare for Red Hat certification. New Horizons can also help solidify your expertise and strengthen the skills you already have. The goal for IT professionals is to be proficient in Red Hat technology and be able to navigate enterprise Linux environments with ease. Courses from New Horizons explore these objectives and allow professionals to focus on strengthening all of their IT abilities, from file and directory management to security and more. Learn more about the types of training courses offered by clicking on each certification below. Red Hat open-source software and products are scalable, reliable and efficient platforms for your organization’s various applications. Red Hat technology is used to power a large portion of the servers that host websites and run cloud-based services for organizations. As such, companies around the world rely on certified Red Hat professionals to implement and manage their Red Hat systems. This means that IT professionals with Red Hat certification are in higher demand by current and potential employers than their non-certified colleagues because they have the skills and training needed to confidently and successfully run the platform. In addition, achieving certification in Red Hat Linux and open-source software systems is one of the top accomplishments in the IT industry. Not only does it set you apart and help advance your career, it also ensures that you are able to get the most out of Red Hat deployments. New Horizons will help you get the Red Hat training you are looking for to help your organization achieve its goals.